On Friday alone, Jamnagar city recorded over 30 cm of rainfall in a single day. Und - 1 and Wodisang dams in the district were put on high alert as it might overflow. with landmark 12 inches in Jamnagar on Friday, the city is topping the chart with highest rainfall received. on Friday the city was completely submerged. I reached Jamnagar on Saturday to find all small roads and gullies blocked with rainwater. older city areas are still under water after a day. In total till now, Jamnagar city had received the heaviest rainfall - 17 inch, Jamnagar flood control room said that all the three major dams in Jamnagar district i.e. 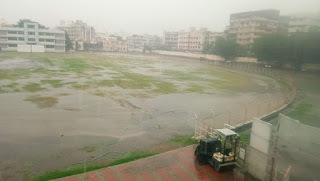 Sapada, Horison and Ruparel have been overflowed in just first spells of rain. Aliabada received 5 inch in last hours of Friday, totalling that to 7 inch. Sapda Dam is overflowing (2 Feet) since last 2 days.